The point of drama (beyond just entertainment) is to tell us something about our lives, something we knew but couldn’t put our fingers on. The requirement of drama is to do this in as streamlined a fashion as possible: all human endeavor leading towards or away from a singular dramatic moment like cosmic matter fleeing the Big Bang. But anyone who has ever been alive knows that human life is not at all like that, occurring in drips and drabs which may or may not add up to anything meaningful. So what happens when a film wants to take on that setup head on, creating an intense coming-of-age narrative centered on a singular time in a young man’s (Zumann) life and then suggests little of it really matters? Have we found a subtle new way to slip insight into our understood patterns, or just profoundly wasted our time? A little bit of both. Mike Mills’ 20th Century Women recognizes the artificiality of the dramatic form and like a modern Brecht wants to make that recognition an intrinsic part of the experience. Even as he presents us with adult-in-waiting Jamie and the quirky societal outcasts who surround (and are struggling to raise) him, Mills continually zooms to the future to show how little these seemingly-pivotal events really tell us about their lives. It’s an important point to make, not just because it puts modern narrative drama in its proper place (something many film don’t even bother with) but in the process it succeeds at what its ultimate goal is supposed to be: it tells us something about ourselves. No one event in our lives no matter how momentous – not our children’s birth or our parent’s death – can either sum up or determine the course of who we are. It’s not the days at the beginning or the end which matter but all the ones in between. And if making that point was all that Mills was after in his third feature film, 20th Century Women would be more successful than it is. But, for all of his recognition of the negative side effects of trope drama, he still wants you to watch this thing. Even as he is trying to express the futility of quirky characters and strange events having any long-term meaning in our lives, he is filling his film with them and belying the point he wants to make in the process. From Jamie’s free-spirited mother (Bening) who eschewed ‘traditional’ female roles to become a pilot and engineer and raise her son to do what he likes as he likes to their upstairs lodger (Gerwig), a cosmopolitan photographer trying to figure out if she is more and Jamie’s long-time friend (Fanning) they are an eccentric bunch whose combined oddities have little to do with what the film is about but do fill up its running time. Mills is a prisoner struggling against his bonds, but only half-heartedly. That’s because if rule one of ‘good’ drama is to reduce important elements to single events, then rule two is to make sure you have interesting and unusual characters involved in those events. Which makes sense but any film bothering with both of those issues is also going to be attempting to use them as a magnet to draw attention to its deeper point. This requires their quirks and eccentricities to be somehow linked to the themes of the story and that is a lot harder than it sounds and is usually where the wheels come off the reason for independent drama. The performances from the trio of leading ladies, a modern version of the three Furies defining every moment of Jamie’s life for him even as they come under scrutiny themselves, are excellent and Mills’ screenplay is capable of some wry humor. But the disparity between three women (and to a larger extent the entire cast) struggling against the cultural expectations of their lives and the continued reminders that the course of their lives will be little affected by those struggles is wide. It reeks of a film which has gotten away from its filmmaker. He wants to say something significant about the joys and pitfalls of charting a course of personal growth against the tide of conformity and about the facts of the human condition which modern drama ignores, but he does seem to know how to put those two things together. Instead we’re left with quite a bit of bobbing and weaving and character choices which don’t make much sense, not in the context of fallible people, but in the context of a fallible director who’s scenes don’t go together in any sort of meaningful way. 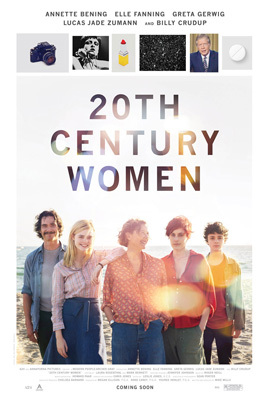 There’s something to 20th Century Women, something real, but a lack of follow through keeps it from ever being anything more than potential. Then again, if we really wanted to see real life play out before our eyes, we probably wouldn’t go to the movies.